The City of Beverly Hills warmly welcomes fine artists to apply to the Beverly Hills Art Show. The event attracts 40,000 or more spectators during the weekend, and takes place on the third weekend in May and October. 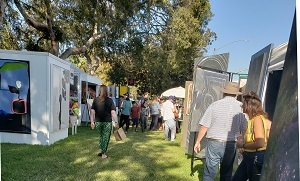 Artists exhibit their work outdoors on the grassy terrain of historic Beverly Gardens Park along Santa Monica Boulevard, between Rodeo and Rexford Drives. It is one of the largest and most respected outdoor shows on the west coast, attracting artists from all over the country, and some of L.A.’s finest. In addition to original art, this two-day art show offers an outdoor dining area, wine & beer gardens, elegant music, and artist demonstrations. An artists’ reception is held on Saturday evening after the show. The May 18 & 19 show will take place from 10 a.m. to 6 p.m. on both days. In order to produce a high-quality art event for the public and for our selected artists, we do have some strict application rules. Your artwork, as shown in 8 pictures of 8 different art pieces within a single media category, as well as a complete display photograph (or accurate detailed drawing), are the major determining factors for acceptance. It should go without saying that you are submitting your artwork, and yours alone. Should you be accepted to the show, you, as the artist, must be present throughout the weekend to show your work. An independent jury panel reviews quality, originality and presentation of artwork in comparison with other applicants in the same media category. These jurors are independent art professionals rather than art show staff; they range from curators to artists, and a new group of jurors is recruited for each show. Acceptance to previous shows NEVER guarantees acceptance to the current art show, as we are committed to presenting new artists just as much as we are to showing returning artists. If you are not accepted to this show, feel free to try again. All artists must understand and agree that the art/artists are selected for the event using qualified art professionals. Not all applicants are selected for the show, and the art selection panel's decisions are final. The application fee is $35.00. The acceptance fee is $395.00. These 2 fees constitute the only fees and/or commissions which are charged by the City of Beverly Hills / Beverly Hills Art Show. An artist may apply in more than one category, but can ultimately only display in one category. If an artist is accepted in two categories, show staff will ask the artist to decide in which category he/she prefers to display, and then will invite the artist to show in that category only; each artist's space is for the display of ONE MEDIUM, one body of work, WITHIN ONE CATEGORY. Applying in two categories requires two separate applications, and therefore two separate application fees. Please consider this before applying in two categories. ALL artwork must fit the criteria for one of the following categories and have been completed within the last four years. Entries in more than one category require separate applications. Booth sharing is prohibited unless both artists collaborate to create every piece! All artwork, of course, must be produced by the artist named in this application. In all categories, 90% of artwork must be original; only 10% of all work can be prints, reproductions, giclées, OR original art in one other category. A print must be an original piece by the artist and signed/numbered. NOTE: Wearable art (clothing or accessories) and household items are prohibited. The sale of notecards is prohibited. The long-ago established purpose of this event is to introduce and promote the sale of fine art to a discerning community. Also, please do not price your artwork higher just for this event, because of the name and location of the event. We do have many very savvy shoppers in this neighborhood! Ceramics All vessels must be hand-built or thrown by artist. Digital Art digitally or partially digitally generated art, including digital art that is embellished with paint or other techniques and photographs that are significantly altered using digital/computer techniques. Must be numbered individually. Drawing & Traditional Printmaking no posters. All prints must be hand-pulled or created in traditional print media and numbered individually. Glass All glass pieces must be hand blown or hand cut and fused by artist. Jewelry Each piece of jewelry must be physically crafted from raw materials (metal, wire, glass, stones) by the artist. Metalsmithing, wire-wrapping, and stones or glass cut by the artist are acceptable methods of composition. No assembling or otherwise compiling of purchased stones, glass, beads or other components will be accepted. Mixed Media – 2D work which is physically similar to painting, drawing, or photography, but which is created using other materials or multiple materials. Mixed Media – 3D sculptural work which is composed of wood, metal, paper, batik, fiber, or other diverse or multiple materials. No wearable art is permitted. Painting oil and acrylic. Only 10% of all work can be prints, including giclée prints. Must be numbered individually. Photography All images to be shot by artist; all prints to be signed and numbered. Commissioned services (i.e., family portraiture) must be secondary to prints offered for sale. Sculpture All sculptures must be hand-built by artist. Watercolor includes gouache. Only 10% of all work can be prints, including giclée prints. Must be numbered individually. Staff recommends that you submit your eight artwork images without watermarks (the signatures or other marks that artists sometimes place over their art). Also, your art images should be high resolution images – they should be 300 dpi or greater. The longest side of any image should be at least 1400 pixels long, and no greater than 4000 pixels. The Show no longer provides booth displays or equipment - artists must provide their own display. A private vendor may be available to assist in providing some of your equipment needs for canopies, wall units, etcetera. Unlike other shows, a space can be requested but there is never any guarantee. Please make sure that you understand this before applying. The Art Show Committee looks at several factors such as: visual impact, flow of foot traffic, and “shaking up” the look of each new show aesthetically. Again, show staff seeks a clean, uncluttered, gallery-type look in art displays. Show staff determines placement of artists based on display photos/drawings. All artists are required to represent their work, and only their work, in person, on both days! This show is widely known for its friendly meet-and-greet atmosphere. Demonstrations during the Art Show are encouraged, and selected demonstrators are highlighted in the event program. If interested, please call (310) 285-6836. The following awards will be presented at the show: 1st, 2nd, 3rd and two Honorable Mentions in most categories. There are also a Mayor’s Purchase Award, a Best of Show, Most Original, and Best Display of Art awards. Artwork is judged Saturday between 11:00 am and 4:00 pm. Names of award winners will be posted in many places, and a ceremony is held on Sunday. 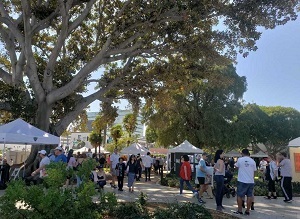 Each accepted artist will be required to sign an agreement / waiver form with the City of Beverly Hills / Beverly Hills Art Show in order to participate in the art show. This agreement will be sent to all accepted artists. California requires that you obtain a Temporary Seller’s Permit before the show, if accepted. This free permit is the only one required! It is a State of California permit, not issued by the City of Beverly Hills or the Beverly Hills Art Show. To register; https://onlineservices.cdtfa.ca.gov/_/ - for questions, call the California Tax Administration at (800) 400-7115.